Οι επιστήμονες κλωνοποίησαν τον δεινόσαυρο spot!!! Οι επιστήμονες του John Moore University στο Λίβερπουλ κατάφεραν να κλωνοποιήσουν ένα δεινόσαυρο! Το νεογέννητο βρίσκεται στην Κτηνιατρική Κλινική του πανεπιστημίου και το παρακολουθούν οι ειδικοί. Ο δεινόσαυρος που κατάφεραν να κλωνοποιήσουν οι ειδικοί, ανήκει στο είδος του απατόσαυρου. Μάλιστα έχει και όνομα: Σποτ. Σύμφωνα με την είδηση οι επιστήμονες χρησιμοποίησαν DNA από απολιθώματα σκελετού απατόσαυρου. Scientists at Liverpool's John Moore University have successfully cloned a dinosaur, a spokesman from the university said yesterday. The dinosaur, a baby Apatosaurus nicknamed “Spot,” is currently being incubated at the University's College of Veterinary Medicine. The scientists extracted DNA from preserved Apatosaurus fossils, which were on display at the university’s museum of natural science. 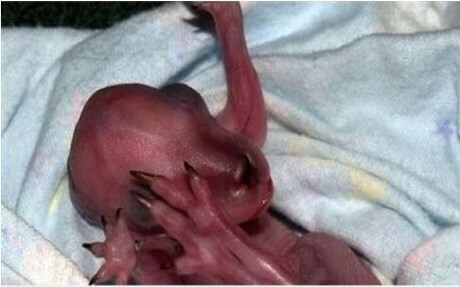 Once the DNA was harvested, scientists injected it into a fertile ostrich womb. The cloning attracted the attention of a wide variety of animal rights activists and religious groups. They claim that animal cloning is unethical and immoral. PETA President Craig Farmer criticized the scientists for performing potentially life threatening threats on a new species. “These scientists brought an animal from the Jurassic age back to life – just to watch it suffer!” he said. But Dr. Sheridan doesn’t seem to be bothered by the activists’ quibbling. She says that the opportunities afforded by dinosaur cloning are endless. Within ten years, we could repopulate the world with dinosaurs,” she said. As of press time, the dinosaur is in stable condition. Scientists plan to run more tests on him today.